1. Get the lead out. I know, you hear that all the time, but I’m not sure divers really take it to heart. Try this. Next time you’re going diving, remove 2 pounds. It’s a good idea to limit your depths when cutting back on lead, as well as using a line to ascend. That way, if you find you are too light when the tank gets low, you won’t have problems causing you to blow through your safety stop. Most likely, you’ll find that two pounds made little difference on the dive, so next dive take another two. Keep doing this just up to the point where maintaining a stable 15 foot safety stop isn’t a problem. At that point, you’ll be properly weighted. Many divers discover they had been carrying around 10 pounds or more unnecessary lead for years. 2. Understand the equipment you’re using. If you regularly rent gear, or travel to dive, variations in tanks and other equipment will affect your buoyancy. Most obvious is the tank. Generally, an aluminum 80 will be a few pounds positive when nearly empty. Steel SCUBA cylinders remain negative all the time. Some BCD’s, especially those that are well padded, can be a pound or two positive. What matters is that you know and make adjustments. I always travel with my own dive equipment, but tanks are provided by the boat operator. Once on borad, I take a quick look at the tank markings and note the manufacturer. Tech divers know that scuba cylinders made by Catalina are going to generally be more positive than those made by Luxfer. Knowing this, even on sport dives, I have a more accurate starting point when making weighting decisions for the first dive. 3. Position your weights for trim. 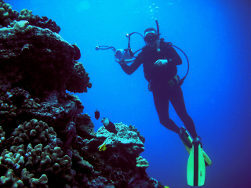 Most of the time, divers position weights on each hip. It just seems like the right place to put it. However, if you are wearing a weight belt, it may give you better control and be more comfortable if you position the weight near the buckle. The lead will act as ballast and tend to position you in a prone, face down attitude, which is more streamlined and keeps your fin tips off the bottom. With a steel tank, it will counter the negative buoyancy of the tank and keep you from rolling over on your back. 4. Use breath control first. In other words, don’t reach for the inflator or dump valve every time you sense a change in buoyancy. Never hold your breath, but make use of the several pounds of buoyancy capacity in your lungs before reaching for a button to push or something to pull on. For example, if you feel yourself sinking, inhale. Your descent will slow or stop, and you may begin to rise. This will give you a reference for the amount, if any, of air you need to add. On the other hand, if you feel you are beginning to rise in the water column, exhale completely and pause. You’ll probably stop your ascent and begin to sink. This should give you a better sense of how much air to vent if any. Remember: Never hold your breath! 5. Add air from the start of your descent. Yup, that’s what I said. ADD air when you start your descent. Of course, you’ll start with a fully empty BCD, but within a few feet of the surface, your exposure suit and any trapped air spaces will compress making you negative. If you make adjustments early, you won’t find yourself accelerating toward the bottom, requiring major adjustments, which are difficult to control. 6. Know what neutral buoyancy feels like. For a lot of divers, especially new ones, neutral buoyancy feels like positive buoyancy. As a result, the tendency is to want to dump air on every breath. It takes practice, but strive to develop buoyancy awareness, and think before adding or dumping air. Unless you are making big changes in depth, those adjustments probably aren’t necessary. 7. Watch other divers. Chances are, you’ll dive with more experienced divers from time to time. Watch them. For example, when you see a diver effortlessly suspended mid-water and not touching a thing (meaning inflator or dump valve), pay attention and try to achieve the same level of control. It doesn’t hurt to ask for a tip or two once you’re back on the boat either. 8. Reference your gauge, but use references. In other words, don’t stare at your depth gauge and try to react to every change in depth. First, the gauge doesn’t react to changes instantly so you’re not reacting to accurate depth information (at least, not in real-time). Also, you lose situational awareness. Reference your surroundings and even other divers to get a feel for your own depth. Glance at the gauge from time to time to confirm your depth, but don’t fixate on it. 9. Own your own dive gear. This way you’ll be diving with the same equipment and gear configuration every time you get in the water. You’ll also dive more often when you don’t have to go through the trouble and expense of renting. 10. Dive, dive, dive. Get in the water as often as you can. Experience is key. The way divers achieve mastery over their own buoyancy is through practice. This entry was posted in SCUBA Instruction and tagged BCD, scuba, scuba instruction.